Is there such a thing as too much pasta? 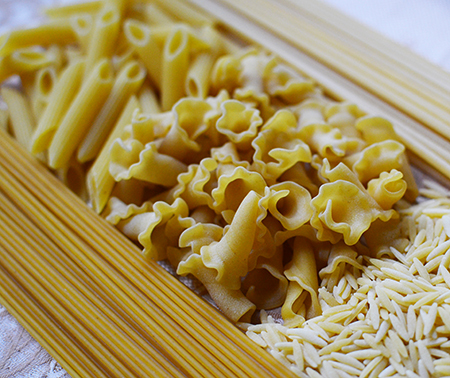 Tradition holds that, in the 1800s, Italians counted more than 250 different shapes of pastas, both fresh and dried. That sounds like heaven to me! Now they report only 55-60 different shapes, and that just breaks my heart. Where have all the pastas gone? I find it particularly interesting that each form of pasta also has very specific sauces that work with its shape. One doesn’t serve clam sauce on farfalle, or orzo with marinara sauce. It just isn't done. This kind of tradition may not be important to you, but it is very important to Italy and its people. Are you wondering if we, here in the Cocoa & Lavender kitchen, always abide by the rules? The answer is, "No, not always." 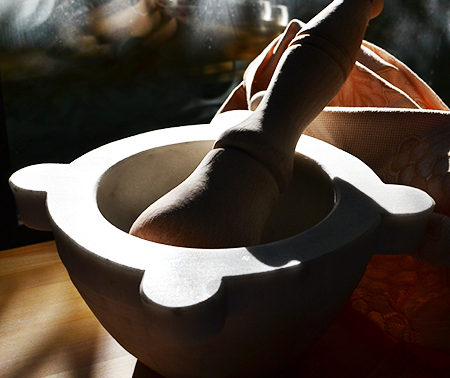 Traditionally, this sauce was made in a mortar with a pestle. But, confusingly enough, neither do the Italians. In fact, you may see one sauce served on a variety of different pasta shapes, depending on the region. Today's pasta sauce recipe is one that, according to the Silver Spoon, is traditionally served on fettuccine. 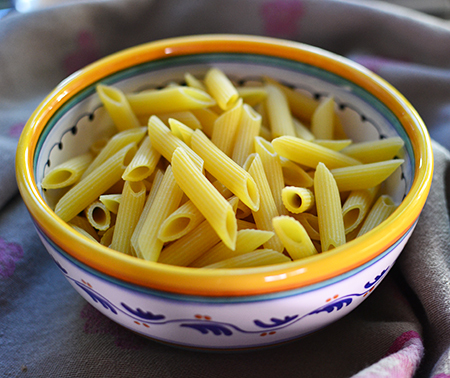 However, according to Giallo Zafferano, Ligurians serve it on pansotti, corzette, or trofie. And, then, I found a reference to Tuscans serving it on penne. I had penne in the pantry. I have been to Tuscany. So I made it with penne. The salsa itself has a few different versions. 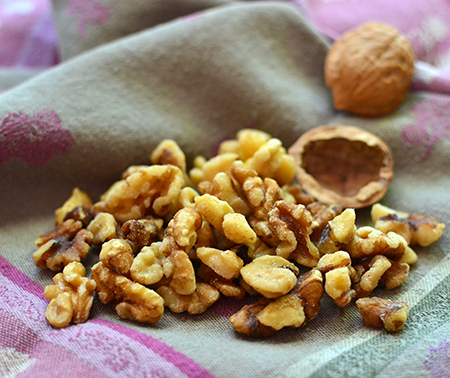 It is often made with basil in Liguria, and I have seen it made simply with walnuts or, like today's recipe, with a combination of walnuts and pine nuts. I think no matter which recipe you use, this cream and nutty sauce with marjoram is perfect for an autumn evening with friends gathered around the table. Melt the butter in a small saucepan. 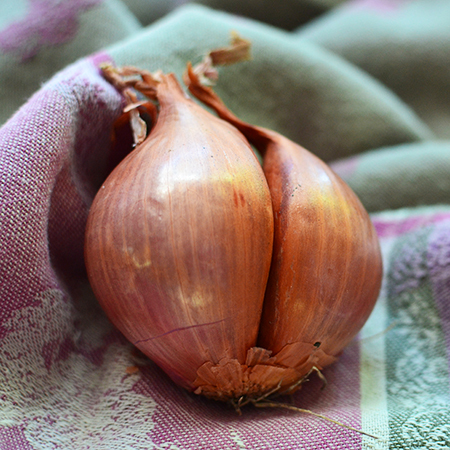 Sauté the shallot until clear. Place shallot, residual butter, walnuts, pine nuts, marjoram and a good pinch of salt into a the bowl of a food processor fitted with the steel blade. Pulse until nuts are finely ground. Add ricotta cheese and 3 tablespoons water; process until creamy. With processor running, gradually add the olive oil until very creamy. 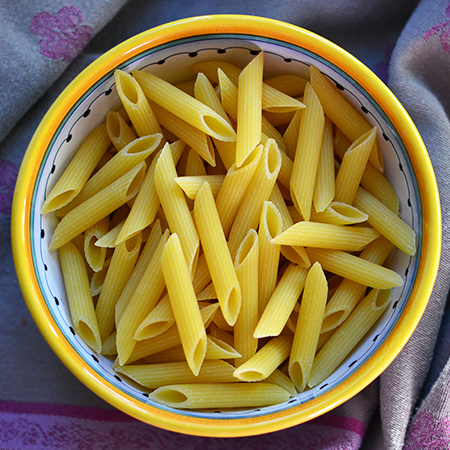 Cook the pasta in salted water, using about 2 heaping tablespoons of salt. When cooked al dente, drain the pasta, reserving 1 cup of the cooking water. 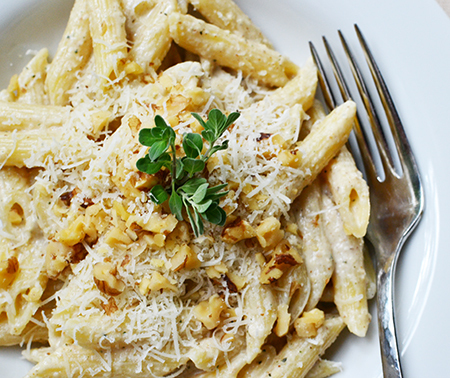 Place the pasta in a large bowl and add the walnut sauce. Toss well and add the cooking water, a little at a time, to reach the perfect creaminess. 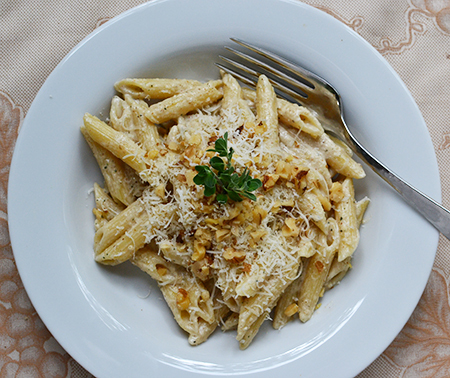 Serve with grated Parmigiano-Reggiano cheese, and garnish with a few chopped toasted walnuts and marjoram leaves. a small piece of paper, and candle drippings. Here are my guidelines for choosing pasta shapes. They are in no way "authentic" but they work for me "generally". Of course I break these rules all the time. But still it's fun to think about them. That is a great guideline for pasta shapes, Greg! I think it's what happens in my kitchen naturally, or should I say luckily! I looove pasta! And yours looks amazing David. Such gorgeous photos you have taken. In Greece we have our own pasta tradition; Greeks eat a lot of it and we make our own kinds of pasta. It's not just the Italians who eat it. Besides, the Chinese invented it ;) I love however the many kinds they have and it's sad that the variety is no longer what it used to be. By the way, I don't play by the rules either. It's all matter of taste isn't it? Wouldn't it be great if there were still 250-300 types of pasta, Magda? We would all need bigger kitchens just to store them! Rules are definitely meant to be broken. Taste (and texture, I would add) mean everything in the end! 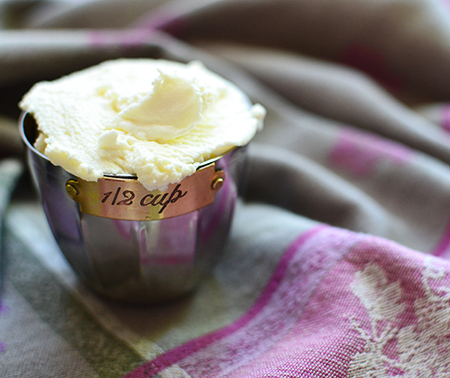 Lovely recipe... and isn't The Silver Spoon an amazing tome! I do love the Silver Spoon, Liz, especially when seeking a sauce that is new to me. Best resource ever. Also, for my garlic allergy, it allows me to know what I can eat in Italy, and what I should avoid. That is one reason I love that Italians are so traditional! The Silver Spoon is an invaluable resource. I made some squid ink pasta from its recipe just last weekend. Perfection! 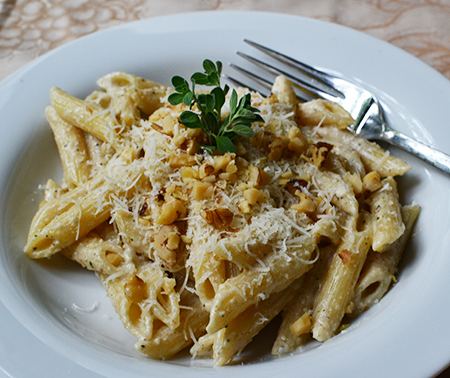 I think I'll be making this nut pasta dish this week. Sounds and looks delicious! I think you will love it, John! It is flavorful yet very delicate. And I can see it as a filling for ravioli, as well! I agree, there can never be too much pasta! This sounds delicious, David. I have a whole bag of walnuts (from a previous recipe where I forgot to add them.... how does one forget to add the first ingredient listed? Hahaha.) and some pine nuts. I wonder if this would good with sage in place of the marjoram? I have extra sage in the fridge. Glad you love the boat Mark made. 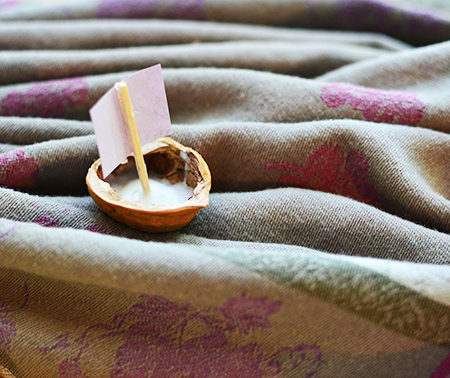 We save walnut shells hoping someday to have our own little armada! Fantastic!! It looked so good that we made it tonight! Rich and flavorful, we served it with a red blend of cab and Syrah made by Chateau Pigoudet in Provence ( where else?). David, it will be one of our go-to recipes! We did cut the recipe in half , though . Highly recommend it!! Susan - cutting the recipe in half still gives you so much to work with! And it lasts well in the fridge! I am so happy you and Towny liked it! It is easy and definitely a "keeper" for us, too. We drank it with "whatever was open" which ended up being a Zinfandel from the Central Coast. It was quite nice. Love the use of marjoram in this. I also use the Silver Spoon but lately have found some of the recipes miss the mark - especially cakes and sweets. Never had any problems with the savoury ones though. Paola - I find their newer series of books on each region of Italy a bit more reliable in the sweets arena. But for the savory, it is my Food Bible! I am so glad to know you don't worry about the shapes, either. It's nice if you have them, but a.) who has access to them all? and b.) who has room to store them all? 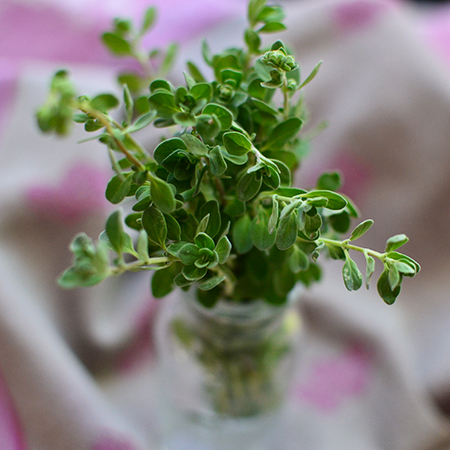 Marjoram is one of our favorites, Susan, and it grows well here in the desert! As for the pasta shapes, The Encyclopedia of Pasta by Oretta Zanini de Vita is a great resource for matching pastas with sauce. Happily, but t has been translated into English! In view of the latest report from WHO, meat and processed meats are pretty bad for us all, so your recipe is perfect for now. and delicious and simple to make as well. and great for our fall weather up here. Thanks, Carol - although I can;t imagine that we will all stop eating meats and processed meats, dishes like this are very enjoyable and certainly filling! 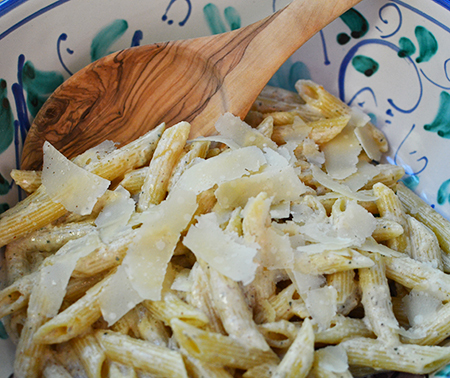 Penne is my favorite pasta, and this dish sounds delish! Thanks for the recipe...I will make it soon. And will make the little walnut boats for my grand kids...don't know who will have more fun, myself or them! And Tuscany is my fav. place in the world! Well, Jean, Tuscany is our favorite place to visit, too. We are trying to go to other places (Germany and Austria this year) but it is definitely a struggle not to go tot Tuscany. This is a great dish for all, and the kids will love the boats! This looks beautiful! I too am generally a 'rule breaker' when it comes to pairing things. Gorgeous dish, if only I weren't allergic to walnuts! I love that you are so bad, Ahu! :) You know, you can make this with a variety of nuts. Try pecans or almonds! Hi David, love the simplicity of this dish, working on my winter garden, will have to pick up some marjoram to plant next. Supposed to get some rain next week....fingers crossed. Cheri - i was up in Phoenix on Thursday and got quite drenched on the way home - did any of the rain make it as far as you? Fingers crossed for your rain, and I hope you get some marjoram! This looks amazing. If my marjoram is still alive when I get home tomorrow (alas unlikely since I went out of town without reminding my husband to water my plants) this could happen soon. I could eat pasta all the time. 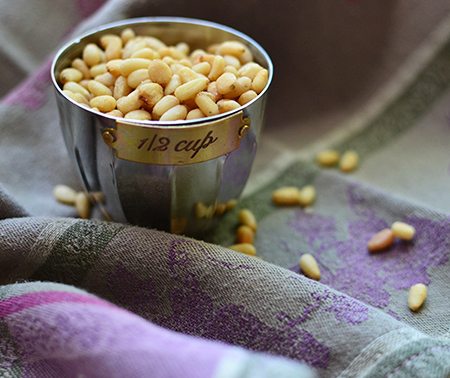 Adding nuts is sensational, especially pine nuts! Here walnuts are used for filling ravioli and sorrentinos, which are like big rounds of filled pasta. They usually include ricotta and ham. Love this variation in a sauce David, so much easier! Have a great week! Thanks, Paula - I always love hearing about how ingredients are used differently between here and there! True (about pasta shapes), true (about using what you like) and true (delicious sauce). Love all kinds of pesto, yours reminded me of Pesto alla Trapanese, with almonds. There's something to be said about cold sauces! I definitely want to try the Pesto alla Trapanese, Paolo. Thanks for your kind comments and for visiting C&L! I remember many years ago saying something about having or serving a certain pasta shape with a certain sauce and my family in Italy almost having a heart attack! As you said, "it's just NOT done"! Yes, they take their shapes and sauces seriously. I don't abide by the rules all the time; it's a matter of what's on hand, but I think there is a reason for each choice (Gregg at Sippity Sup has got it down)! I hope you enjoy the walnut sauce while your daughter is away! Can she at least enjoy the boats? Italians break those rules all the time. Often they're not rules at all, they're regional traditions. I grew up in Milan, my mom always made spaghetti al ragu`, which is considered a big no-no in Bologna, which is only about 200 Km away. Paolo - I heard that same thing form my cugina in Bologna (she was raised in Vermont). She served spaghetti al ragù and was told never to do it again but her friends in Bologna. :) Hence your Cannolo Award! Colette - have a great visit with your mother-in-law! I hope you all enjoy the pasta! Hi David, I'm your newest subscriber, stopping by to say I love the look of your blog and can't wait to dig into your posts! I'm delighted to be connected in the blogosphere! Welcome to Cocoa & Lavender, Lois! I hope we get to meet soon outside the blogosphere, especially as we live in the same city! Dear David, there is no such thing as too many pasta shapes or recipes - another great one to be enjoyed with the loved ones! Andrea - I am so glad to know the girls make little walnut boats in school! I think you will all love this pasta. Hi David, my first visit to your blog. Excellent blog with very well taken pictures. Your comfort pasta look really good, thanks for sharing your wonderful recipe. Love the little walnut boat, so cute. Thank you, Amelia. Welcome to Cocoa & Lavender! I really enjoyed perusing your blog, too - it is fun to get to know new friends! David - Yummy! I had no idea that there were once so many pasta shapes. Sadly now that I only eat GF pasta there are very few shapes but at least the pasta tastes pretty good. I love the walnut boats. They would make cute place cards. And this sauce will be good an ANY type/shape of pasta! We love making the walnut boats, too. Great idea about place card holders!